Recognizing the benefits of extended turn out for healthy horses, but also cognizant of the potential hazards of a bad paddock design, Beverly spent months in consultation to design a paddock layout that allows safe and convenient turn-out for all residents in its 14-stall barn. 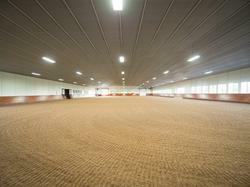 In general, all paddocks are built with the highest quality safety and convenience features. Specifically, all exterior and interior fencing is four-board with three-quarter posts for durability and all paddocks are double-fenced to prevent possible dangerous contact between neighbors. Additionally, all paddocks are serviced by all-weather automatic waters and nearly every paddock will have access to a run-in shed during inclimate weather. Because different horses have different needs, the paddock design incorporates a variety of sizes to accommodate horses that can be turned out together or single horses that must be separated. There are also a number of small medical paddocks with stone dust footing close to the barn to allow horses that must be confined due to injury or kept off grass access to outside turn-out. Placement of the paddocks on the property has also been subject to scrutiny. Recognizing that horses are happier and less likely to run if they are closer to the barn and can see other horses, Beverly situated its paddocks so that all entrance gates have an unobstructed view of the barn. All fence-lines are gracefully curved to avoid any pinched areas or corners that could trap or bunch horses. Plus, the curved fence-lines follow and enhance the natural topography of the farm and add to the overall aesthetic of the complex. Like paddock placement, paddock access has been carefully considered. All paddocks are accessed by all-weather stone dust pathways. The stone dust keeps the highly trafficked pathways from becoming muddy and they can be easily plowed in the winter so that horses can be safely led on good footing to and from their paddocks year-round. In addition, all paddock dates have upgraded gates with solid grate bottoms to prevent horses from getting caught in between gate panels. And, because bringing horses in and out of paddock gates is a time when horses can injure themselves (or their handlers), Beverly has installed special gate latches that can be operated easily with one hand, either on the ground or mounted, and that allow the gates to swing both ways and secure for safety of egress and ingress. Miles of trails meander through the fields and woods of the property. There are two RV hook-ups conveniently located aside the northern side of the indoor arena. This area also has access to an outdoor wash rack and bathroom with a shower. Permanent horse trailer parking is available on an easily accessed, dedicated parking pad by the Zulla Road paddock.